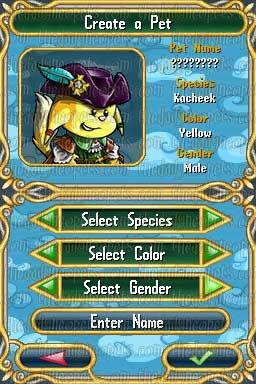 When you start the game, you get to pick from twelve different Neopet species in six colors, with minor variations for genders. The images are amazing, though some are a bit nicer than others. Game play is very simple. When moving on the map, you just drag your stylus to see around the map and tap the building or area with a star over it to go to the next area. Your little character sprite then takes a nice walk to where ever it is. There is a single walking sound played when you start that's rather cute but gets a little old as the game progresses. Some of the longer walks are a little time consuming, but they're not that bad since you get a nice view of the scenery as you go. Of course, that's just in the over world. When fighting enemies (be it a petpet that you're trying to catch or a boss bad guy) you play Reversi with them. Reversi (also called Othello) is a fairly simple game where the goal is to turn all of your opponent's tokens to your color or, barring that, have the most tokens on the board when the game ends. When you play, it's a simple matter of tapping the square you want to play in. Of course, this game wouldn't be very fun (or very Neopian!) if it was just that. 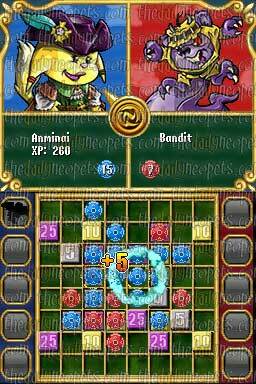 As you play, you collect a total of 25 petpets, each with a unique ability, that can be used to give you an advantage, or even help win the game! They come from all different worlds, not just the ones that you visit during the game. 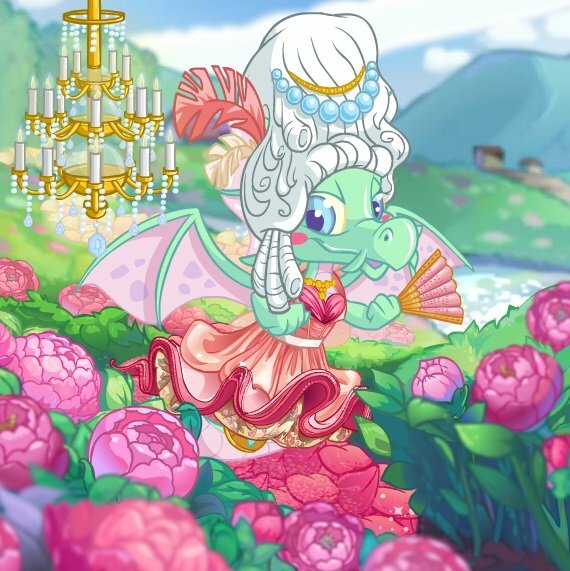 As you level up you are allowed to use more petpets during a game. The maximum is five, but with the right combination, this can be more than enough. 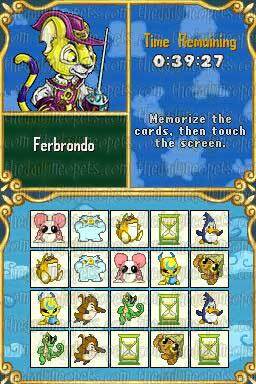 True to Neopets style, if you lose a game you can replay it without delay. While this is nice when you're really into playing, it can get a little old after a while if you keep losing to the same opponent. But that's not the end of the games- there are three mini-games as well, one of them exclusive to the DS! The first is a game similar to Destruct-O-Match where you remove grouped blocks and try to remove enough to beat the given score. The second is a basic memory game, though as the levels go higher the cards start switching places as you try and match them. The third DS exclusive game is called Quick Draw. 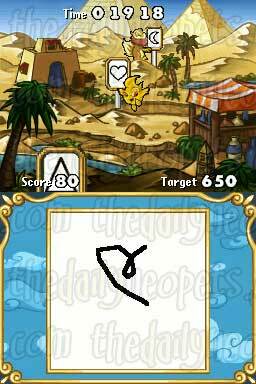 As petpets go by holding signs with different shapes on them, you draw the black shapes on the touch screen and ignore the red ones. 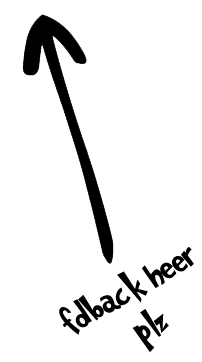 They don't need to be perfect and you can lift your stylus at any time as you draw for better accuracy or comfort. 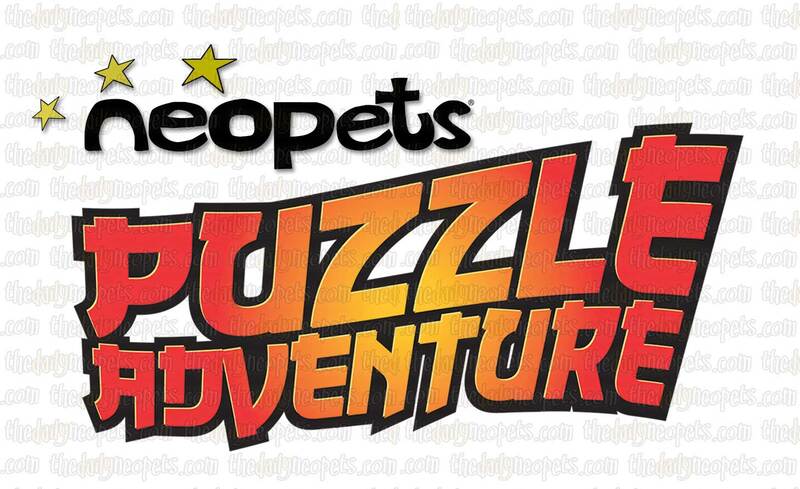 Be warned though- As the levels get higher the petpets move faster and your wrist will get sore pretty quick. When it comes to graphics, the maps are simply stunning. Each and every one of them is beautifully detailed with major landmarks and shops from the given world there in their proper place. In fact, there are times when they look more like a painting than pixels! The animations during the games of Reversi are nice as well. The board is well designed and the colored sparks that fly off the board when you flip tokens never fail to be entertaining. As for music, the fair length, looped tracks always fit their respective worlds and were subtle and pleasing enough to be ignored or enjoyed as needed. And what's a good game without a good storyline? Like any Neopian plot, things go from running errands for the crew of the Cyodrake's Gaze to saving Neopia rather quickly. The cut scenes between each game make sense and provide a little insight to the personalities of the Gaze's crew, though it's all too easy to accidentally skip chunks of dialog as you tap through it. 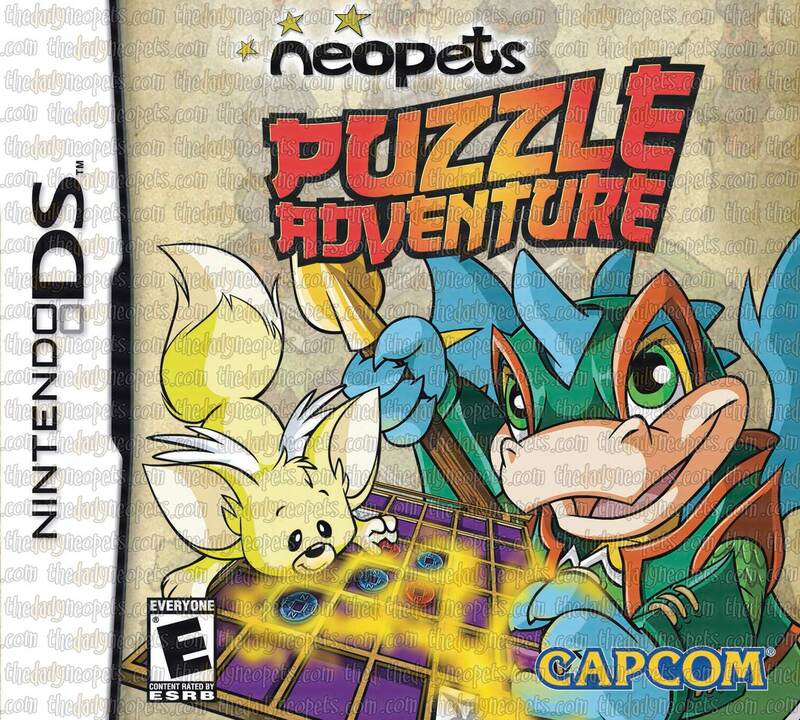 Of course, even with the story, I often found myself wondering where exactly petpets learned to play Reversi and how I managed to beat off bad guys with a game- Or why they even stopped to play for that matter! 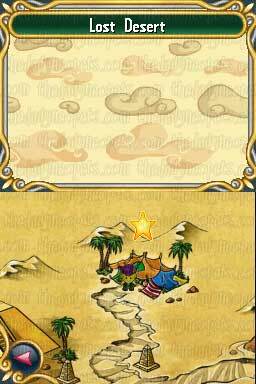 And to top it all off, as you play, you collect codes that can be submitted on Neopets for items and NP! There's a total of eight codes in the DS version. 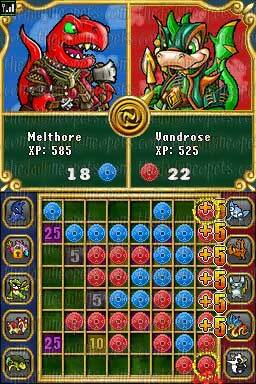 Overall, Neopets Puzzle Adventure is a strategy heavy game with a unique Neopets twist. It's got a moderately high replay value, and a handy quick play feature for if you just feel like a game. It's a great boredom killer and even has a 2 player wireless feature so you can play your friends! If you were to ask for a rating, I'd give this addicting little game an 8.5 out of 10. It lost some points for the shortness of the game and a few things that made little sense, but there's no resisting the stunning graphics and fun board game. And remember: This review is for the DS version of the game. 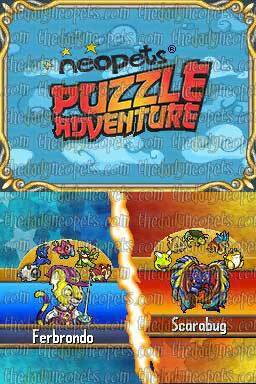 The Wii and PC versions have 100 petpets to collect, as well as many other features and quests that you won't find in the DS version, but they don't have the play on the go advantage. But no matter the platform you go with, it's a fun game! 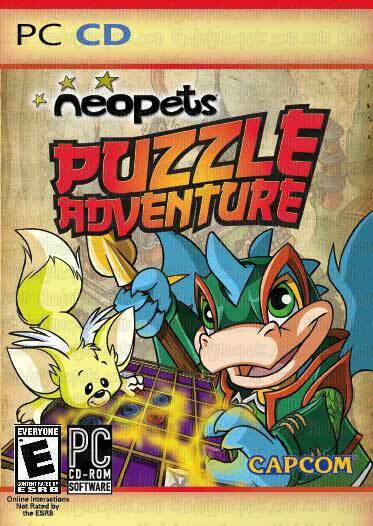 If you're a Neopets fan, get this game! The Snowager is awake. He'll be sleeping in 19 minutes, 36 seconds.